Whether you are a senior, or someone living at home with a disability, it’s important to have a winter safety plan in place, especially here in Rural Maine. Our winters are long and very cold. In order to thrive in place we need to be prepared. Here are some good ideas to help you make your winter safety plan. Share your safety plan with your loved ones and neighbors in case of a winter emergency. Before winter starts, make sure you have your furnace and chimney inspected and cleaned. If you use firewood, be sure that you have an adequate supply that is dry and nearby. If you use oil, considering setting up an auto fill with your supplier so you don’t run out. Keep all of your heat vents clear of clutter, and be extra careful with electric heaters. Make sure your carbon monoxide and smoke detectors are working with fresh batteries. Also it’s a good idea to have a fire extinguisher, a flashlight and candles. Try to keep your rooms well lit and have all of your emergency exits available. If you are someone who takes medications, you should have at least a seven day supply of your medications on hand. Check that your medications have not expired, and also ask your doctor or pharmacist how these medications might affect you in a cold weather situation. Will they make your body lose heat? Make you drowsy? It’s good to find out. If you use oxygen it is important to have enough back up oxygen tanks for 3-4 days. If you use motorized wheelchairs, scooters or a lift, you should always have a back up battery charged and ready to go. If you are unsure if you have a backup, you or your caregiver should check with the medical supply company where you get your equipment. It’s a good idea to keep a cane and a walker on hand, just in case. CPAP machines and other medical devices that are electronic may have battery backups. Find out, and make sure you have the correct batteries available if the power goes out and you don’t have a generator. If you are someone who has a home health aide or caregiver, talk with them and their agency about what happens in a big storm. Will the previous shift be able to stay with you? Will a replacement come if something happens to your scheduled caregiver and they can’t make it to you? How long can you expect to be alone if your caregiver has an emergency? You and your loved ones need to have this information ahead of time and the phone numbers of your caregiver’s agency on hand at all times. Try to have a week’s worth if possible, of non-perishable food and water available and a manual can opener. If you have pets, keep extra food for them in case you are snowed in for a few days. Also it may be a good idea to keep those disposable pet pads on hand in case you get snowed in and can’t let your dog out to relieve himself. 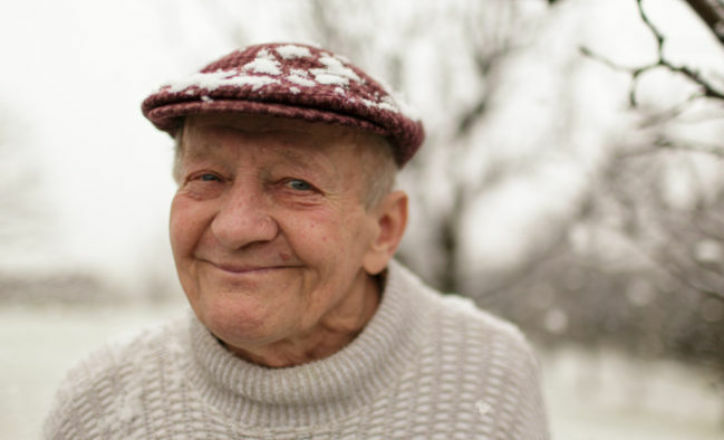 Frostbite and hypothermia are a huge danger to seniors, especially if you live alone. Keep your thermostat at 65 degrees or higher and always dress warmly even while you are inside and when you go to bed. Some medications and alcohol can drain your body of heat. If the power goes out in the middle of the night, an extra layer of clothing can help keep you warm. Falls are also a serious risk during the winter. Try to think of the scenarios where it’s possible that you could fall and create a practical plan. Perhaps invest in some spiked shoes or YakTracks to help you with walking on slippery ice. Wear non slip socks or slippers in the house. Try to keep your walkways salted. It is a good idea to always keep kitty litter on hand, even if you don’t have a cat. Kitty litter can help give the icy ground traction and can help prevent falls. Reach out to friends, neighbors with kids or church members to have someone come shovel your driveway for you. Shoveling heavy snow can cause heart attacks, so why risk it? If you cannot find a volunteer to help you, ask someone to recommend a shoveler you can pay to help every storm so you don’t have to worry. If you live alone, keep a charged cell phone nearby at all times. Also keep a few of your neighbor’s phone numbers in the contacts in case your relatives live far away. If you live with neighbors nearby, try to reach out to a few to see if they could check on you during and after storms. If this is not feasible, it may be a good idea to reach out to your local police or fire department so they can give you a well-being call to make sure you are ok. If you are traveling during the winter, please give yourself extra time. It is a good idea to have studded snow tires put on your vehicle before the winter starts. Keep an emergency kit in your car in case you go off the road. Have a hat, mittens, flashlight, shovel, ice scraper, snacks and water in your kit. Also keep a charged cell phone with you, and your cell phone charger. Tell someone where you are going so in case something happens, so people will know when to start worrying and where to start looking. By using these winter safety tips and communicating with your loved ones, caregivers, and neighbors you can help keep yourself safe during the winter months.